My name is Jamie Landry and I am one person in a world of many. Despite this I deeply believe that I, one person with a voice, can make a difference. I grew up in a quaint New England town with a supportive community and parents who encouraged me to speak my mind. The combination made believing I could make a difference very easy for me. My beliefs and morals had yet to be challenged by the reality of politics, consumerism, and a cacophony of societal pressures. Out of high school and feeling ready to take on the world, I sought to escape the comforts of a small town. I moved eight hours from home to attend college. It wasn't until graduating four years later, when I realized I had still been living in a bubble all that time! To my surprise I was a college graduate staring the “real world” straight in the eyes: having to make my own dinners, purchasing my first car, and making every life choice from picking out floss to buying furniture. I had to do it all on my own. Fortunately, I transitioned out of college and found myself surrounded by an extraordinary circle of friends and living abroad in Iceland. I decided to pursue a graduate degree in a progressive European country and from a considerable distance began to re-examine the culture in which I had spent the first 22 years of my life. All the pressures I had so conveniently avoided in my youth –politics, economics, natural resources, health, and society were being heavily debated by my peers in academic and social settings. Realizing the weight of these issues, I fearfully considered the possibility that perhaps one person couldn't make a difference. Living abroad in Iceland was where my battle with toxics began. It took stepping outside my comfort zone to recognize just how serious the issue is. You must be wondering – what does this have to do with my story of toxics? While my personal story of contamination began long ago, it wasn't until I turned 22 that I took control and became the writer of my own toxics story. While abroad, my forward-thinking and inspiring colleagues pushed me to question things I had always taken for granted in that picturesque, New England town where I grew up. A question introducing the notion of harmful chemicals being added to so many of our daily goods and products was posed by a Finnish classmate who asked, “Do you know if Parabens are banned in the US?” I replied, “Para- what”? I didn't know it at the time, but her question sparked a passionate fire that now burns within me. With support from many along the way I find myself, four years later, speaking up and sharing my story. It’s a story about me, one person in a world of many, making a difference. I have challenged the presence of toxic chemicals in my personal and professional life for only a short time. At first I wasn't so confident going to battle. Confronting and fighting toxics is an emotionally challenging journey. Initially I was confused: you mean to tell me manufacturers can put untested chemicals in products and not even tell us? Then self-conscious: do I have anything in my home that doesn't have toxic chemicals in it? What kind of person does that make me? Later I was angry and panicked: I went completely off the deep end, throwing out nearly all my products and belongings. I lost friends over the issue and argued constantly with my family that we were killing ourselves and the precious environment. Time passed and I began rationalizing my emotions – understanding how it wasn't my fault that healthy consumer decisions were so difficult to make. At present, I am empowered. I am proactive by speaking up for myself, friends and family, and future generations. I have realized we don’t need to be scientists, politicians, lawyers, or manufacturers to choose to make a change; all you have to be is human. I am one living (and positive!) example of someone who has been through the toxic wringer. I came out on the other end a little bruised, battered, and perhaps contaminated, but I also came out ready to turn the tide. Begin by understanding that we are not protected by our laws and regulations on toxic chemicals. Sadly, many people are not even aware of this. Acknowledge that you have a voice and the power to help yourself and future generations. Start by using your voice when making choices about food, personal care, and lifestyle. As a consumer you have the power to vote with your dollar. Every purchase you make says something about the kind of world you want to live in. If you’re looking to do more, get involved in local and state government. 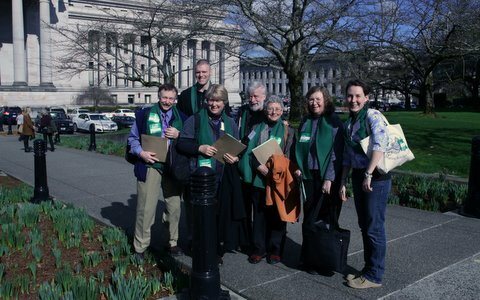 Write a letter, attend a lobby day, or financially support organizations that fight against dangerous chemicals. Environmental Lobby Day at the Capitol in Olympia. Toxics are toxic. They have the power to corrode your spirit and body – But just as love defeats hatred, knowledge will defeat toxics. Knowledge is power. If you and I educate ourselves, we will have the knowledge and therefore the power to choose an alternative. We can choose health over sickness, courage over fear, and having a voice over oppression. Jamie Landry is the Citizen Science Coordinator at the Port Townsend Marine Science Center and a resident of Port Townsend, WA. She works closely with The Toxics Project – an effort by the PTMSC to empower people with knowledge and resources to fight for their health, and the health of the marine environment. Please visit our exhibits and be inspired to start your own journey. Excellent piece, Jamie! If it ever seems like just one person is not enough to make a real change in the world, we simply need to remember that it is the only thing that ever has. I look forward to talking with you again soon. We really enjoyed our showing up in PT and we've been doing a lot more of them since then. Tonight we'll be in PA at the Little Theater on the Peninsula College campus. The film has done pretty well, winning at one film festival and being shortlisted by another. Now we're getting the gears cranked up for the next one. Stay busy, and I really like your writing.